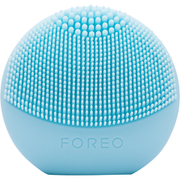 Treat and transform skin with the FOREO LUNA™ go, a compact, travel-friendly facial-cleansing device designed to provide a professional standard of skincare with its invigorating one-minute ritual. 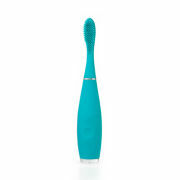 Specially tailored to treat sensitive skin, the facial brush inspires a healthier-looking complexion; helping to gently clear and clarify for a luminous glow. Combining T-Sonic™ Pulsation Technology with soft, specially customized silicone touch-points, the device gently yet effectively cleanses and exfoliates with a single intensity; its soft, non-porous touch points perform a gentle cleanse on sensitive skin, lifting away dirt, oil and makeup residue for a fresher complexion. Flexible and easy to use, the silicone 'bristles' are ultra-hygienic and resist bacteria build-up to keep skin fresh and clean.